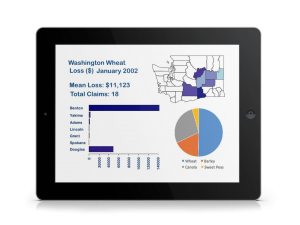 Four state region of Washington, Oregon, and Idaho as well as western Montana, where ag commodity loss example analysis is focused. Agricultural systems and their products are essential components to our society. In 2014, the U.S. agricultural sector created a gross output of more than 835 billion dollars, and had an employee base of approximately 750,000 people. With roughly 2 million farms in the US, with an average size of about 435 acres, total grain production alone was $436 million (USDA Economic Research Service, 2014). For the state of Washington, agriculture production value exceeded $10 billion, with over 160,000 jobs, making up 13-15 percent of the state’s economy each year. 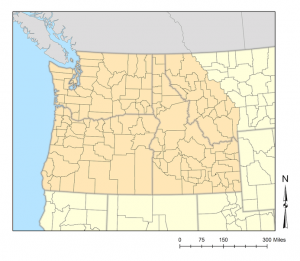 (WSDA drought report, 2015). Similarly, the Washington forestry support industries generated over $1.8B in total economic impacts across the same time frame. This hypothesis proposes the development of a spatially explicit machine learning model to better understand the relationships of climate outcomes with agricultural commodity loss. The USDA’s archive agricultural commodity loss (1980-present), with associates climate damage causes, will be used as a data source for our initial predictor, used as an estimate of agricultural climate impact. The USDA’s agricultural crop loss data archive (1980-2016). The USDA’s Risk Management Agency has insurance claim records associated with commodity crop loss from 1980 to 2016. Specifically, we are using the cause of loss archive datasets, which are .csv files which summarize insurance claims by month and by county. This data is available for the entire United States. 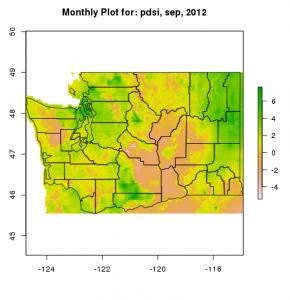 Downscaled gridded climate datasets from 1980-2016. There are several excellent resources that provide gridded meteorological data for both historical and future scenarios (Abatzoglou, 2010, Thorton et al, 2014). With regards to this analysis, we will use GRIDMET data, in combination with other relevant datasets that might assist in understanding crop loss variability and spatial patterns. *Abatzoglou J.T. and Brown T.J. “A comparison of statistical downscaling methods suited for wildfire applications ” International Journal of Climatology (2012),doi: 10.1002/joc.2312. The dataset MACAv2-METDATA was produced with funding from the Regional Approaches to Climate Change (REACCH) project and the SouthEast Climate Science Center(SECSC). For this supervised example, our goal is to develop a finely tuned hypothesis predictor function h(x). Learning consists of using mathematical algorithms to optimize this function so that, given input data x about a certain domain (say, a county with a maximum temperature above a certain value), it will attempt to predict x (agricultural crop loss for a commodity, county, and season). Determining which feature variables to ultimately use (as well as their spatial and temporal constraints) is an important part of this design. Optimizing the predictor h(x) is done using cross validated training and testing. For each training example, we have an input value x_train, for which a corresponding output, y,(crop loss), is known in advance. For each example, we find the difference between the known, correct value y, and our predicted value h(x_train). With enough training examples, these differences give us a useful way to measure the “wrongness” of h(x). We can then tweak h(x) by tweaking the values of Θ1 and Θ2 to make it “less wrong”. This process is repeated over and over until the system has converged on the best values for Θ1 andΘ2. In this way, the predictor becomes trained, and is ready to do some real-world predicting. Agriculture Data Discovery Dashboard: Analytic dashboard that explores agricultural commodity systems data compared to a variety of related variables. Agriculture Prediction Dashboard: Streamlined widget/dashboard that provides explicit predictions on insurance commodity losse claim counts – by commodity type.